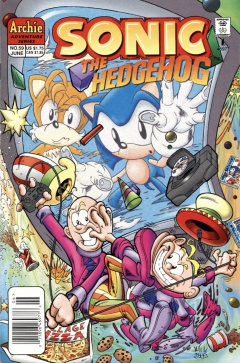 Sonic the Hedgehog 59 is the fifty-ninth issue of the Sonic the Hedgehog comic. This issue features two stories. The main story, entitled "Opposites Detract", and the back-up story "Tales of the Freedom Fighters - The People's Princess". While on the trail of the evil sorcerer Ixis Naugus, Sonic and Tails happen upon a mysterious zone portal. Sonic remarks that these rifts have been endemic to the planet ever since Robotnik fired his Ultimate Annihilator in issue 50. Sonic cautions Tails not to get too close, otherwise he may get pulled into an unknown zone. But Tails can't help it; he's being sucked in... Just as Sonic is. They both get sucked in, and awaken in a chaotic zone where the laws of physics are topsy-turvy. Sonic looks around for Tails, Tails calls back to him, specifying that he's right below Sonic. But from Sonic's perspective, Tails is above him. That's when Sonic realizes he's been to this zone before. Before he can specify, an explosion knocks the duo around. Nearby, the explosion's source is revealed to be a shot fired by Horizont-Al, who is watching Sonic and Tails alongside his nemesis, Verti-Cal. They figure they could simply brainwash and use the intruders as their combat slaves, which may prove amusing. Al reveals that long ago the two were carefree companions, ruling this zone and spending their time playing games. Cal remarks that Sonic once was privy to seeing their former selves at play. But then, the Ultimate Annihilator was fired, decimating their zone back to a subatomic level. Al and Cal barely survived as ethereal protoplasm, evolving back to complexity. As their zone recovered, so did their powers, but now they mistrust one another, each blaming the other for the destruction of their previous existence. Now their existence is dedicated to battle, battle for sole control of the zone. They each fire volleys, recoup and remember that they were going to enslave Sonic and Tails. Sonic and Tails, since having recovered from the blast, resume their conversation. Sonic tells Tails that the zone didn't used to be so violent, and that the natives were friendly guys. As he says that, Tails sinks into a platform, screaming for Sonic's help. Sonic is unable to help, however, as he is snared in a whirling vortex. Moments later, the two emerge at arms, clad in armor and spouting loyalty to their rulers, Al for Tails and Cal for Sonic. Tails opens hostilities with spinning his twin tails rapidly at Sonic. Sonic recognizes it as similar to his own Sonic Spin, and counters. They clang weapons, and Tails lands a blow to Sonic's jaw. Al and Cal watch, they provide commentary. Sonic seemingly loses his temper, leaving Tails the chance to land another blow, but it is in fact a ruse which gives Sonic the upperhand. Tails' tails are now tangled up in Sonic's weapon, while Sonic goes into spin mode to deliver the final blow. As Sonic inches closer, Tails suddenly remembers the truth: That Sonic and Tails are friends. This gets through to Sonic, and hostilities cease. Al and Cal fly forth wondering what happened. The two should not have been able to break their control. Sonic recognizes them as Al and Cal, and asks why they've taken to being violent demi-gods. Sonic reminds them that the two used to be great together, and Tails add that if there are ever to be any physical laws in this wacky zone, then the two need to stop fighting and work together. Even if they cannot be friends, they can at least try to be neighbors. Al and Cal contemplate the idea of being friends again. They decline and resume firing on one another. Sonic grabs Tails and bolts. They get spit out of the zone just as its portal vanishes. Tails wonders whether Al and Cal are going to be fighting forever and ever, but Sonic is more interested in finding the nearest chili dog. Princess Sally, Rotor Walrus, Lupe Wolf, Hershey Cat, Hamlin Pig and a horse named Erik are skydiving. They split, with Sally free falling, wishing to stay in the sky forever. She lands, and a nearby farmer looks on amazed. She asks him if he's seen her friends. He has, then offers them the opportunity to stay for dinner. Sally accepts, but first they need to find Erik. They find him in a nearby tree, unhurt except for his pride. Sally tosses a knife that promptly cuts his harness. Erik is impressed at her aim, much obliged as well. They continue the search for Lupe, finding her after she howls. They then all sit down for dinner. At Nightfall they return to Mobotropolis, where Sally's former guardian Rosie offers her some cocoa before bed. She accepts. Watching on the monitor is Geoffrey St. John and the King, who orders St. John to bring the princess before him. He needs to have a talk with her. This is Horizont-Al and Verti-Cal's first appearance since "Vertigo-a-Go-Go" in issue 02. The game console on the cover is a Sega Saturn, with insignia on the controller and copies of Sonic Jam and Sonic 3D: Flickies Island displayed.